One of my favorite weight loss topics to talk about is infused water! I began making infused water back in April 2012 with my first infused water post Day Spa Apple Cinnamon Water. That recipe turned out to be really popular, and went viral on Pinterest with over 2 million views within the first year. Since then, I have created a lot more infused water recipes, and written a book called Fruit Infusion: A Collection of Day Spa Inspired, Fruit Infused Waters. These simple infused water recipes are inexpensive, have almost zero calories, and taste great too! Also called detox water, fruit flavored water, or fruit infused water; infused water can generally be any combination of fruits, vegetables, and herbs immersed in cold water. For a full one week detox plan, check out my Detox Diet Week post and give your weight loss a kick start, try a detox smoothie, or a Detox Tea for a hot water detox drink. Special Tip: Fruit infused water is great to bring along with you and sip all day as a delicious hydrating treat. To make it easier to take on the go, check out our Recommended Fruit Infused Water Bottles or see our list of the Top 5 Best Seller Fruit Infused Water Bottles. With one of these fruit infuser bottles, you can refill the water over and over again and the flavor of the fruits and herbs will still infuse into the water. It’s worth the $10-20 investment in your health! What Are The Benefits of Infused Water? Water and weight loss go hand in hand. Drinking water to lose weight and be healthier is one of the easiest habits you can have, especially when you can make so many types of infused water recipes to choose from. So if you want to lose weight fast without much extra effort, try drinking more water. I made this infused water instructional video for eHow.com, the largest how-to site on the internet. Everyone has their favorite fruit infused water ingredients, but some are more popular than others. Fresh lemon, lime, strawberries, apple slices, and oranges and the most popular fruit ingredients, while cucumber slices, mint, basil, cinnamon, and ginger are the most popular vegetable ingredients. When it comes to popularity, Lemon Water is the undisputed king of them all. 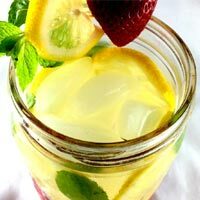 Also called Lemon Detox Water or Lemon Water, this detox drink recipe has the benefit of being really simple and tasty. 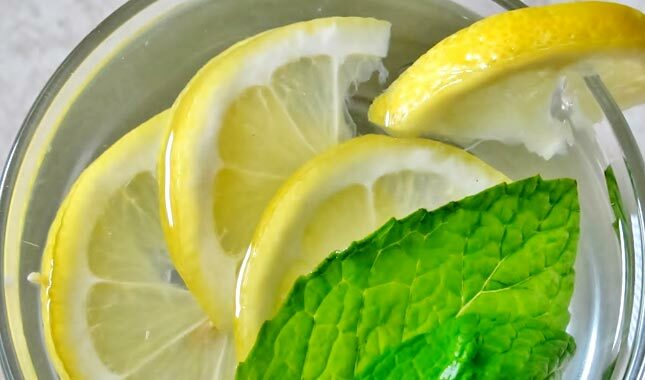 Even though this lemon water detox recipe has only two ingredients, lemons and mint, the sweetness and sour from the lemons create a delicious flavor while also providing lots of Vitamin C and the mint adds a refreshing taste. 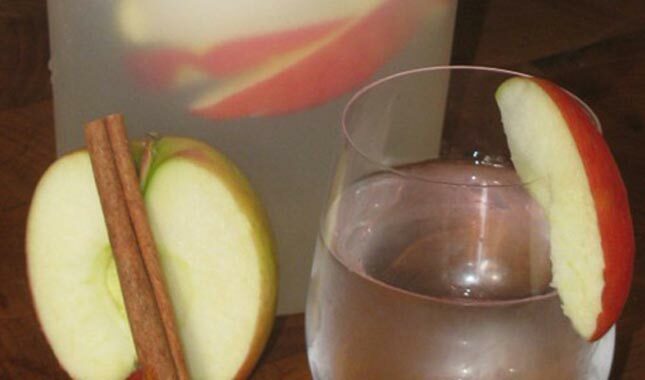 This Day Spa Apple Cinnamon Water recipe has been my most popular personal fruit infused water recipes of all time. I originally wrote the Day Spa Apple Cinnamon Water recipe on a blog post back in April 2012, and it got picked up on Pinterest right away. Within 2 weeks I was getting 40,000 views a day on my website for this recipe! Also called Detox Apple Cinnamon Water, this fruit water recipe is delicious and has the benefit of being metabolism boosting. Did you know Ginger and Mango both boost your metabolism? This Mango Ginger Water recipe has been at the top of the charts since it was first introduced. Along with boosting your metabolism ginger also is a natural pain reliever, from migraines to menstrual cramps ginger heals a lot of pain. It also helps reduce morning or motion sickness and banishes heart burn! It’s no wonder this recipe is so popular! This refreshing Tangerine and Strawberry Infused Water recipe contains fruits that are high in Vitamin C and are big metabolism boosters! 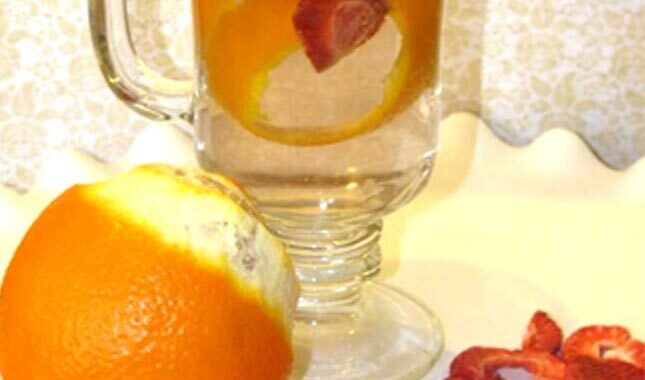 Strawberries and tangerines one of my favorite combos, and both hot and cold this is a delicious drink. This year-round favorite will have you drinking more water quickly. This is the classic lemon water recipe you’d find everywhere, and in the top 5 for good reason. It’s got the great taste, and the health benefits of the cucumbers and lemon juice flush your system and help you feel better. 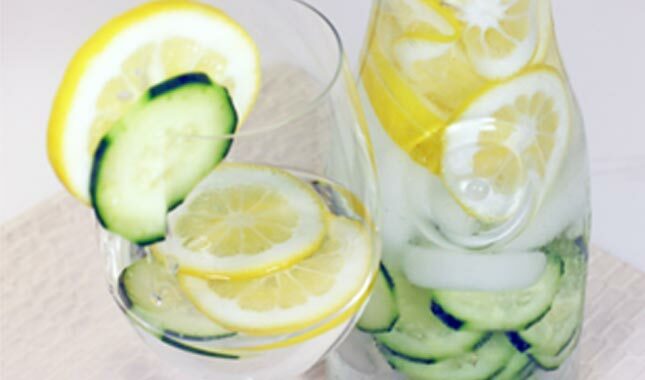 Drinking cucumber water for weight loss is also very popular recently because of one main reason….it works well! Did you get that? Just by drinking water your body increases its burning of calories. You know that soda is bad for you, including diet soda. Caloric beverages steal your health and steal great food from you because they fill you up with all the wrong stuff. Soda is the #1 culprit for the diabetes epidemic in America. Drinking infused water for weight loss is one of the easiest things you can do for better health. Experts suggest that the average person should consume at least 64 ounces of water a day, but I recommend you drink up to double that amount for weight loss. But how do you drink that much water if you don’t like the taste of plain water? 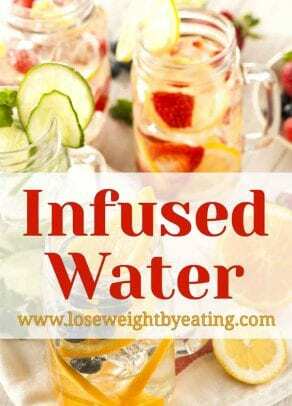 Many people have found drinking infused water for weight loss is the solution. Naturally helps your body release fat cells. Because infused waters are naturally low in calories and contain no artificial ingredients, you can drink as much of it as you want. Some detox water recipes like Day Spa Apple Cinnamon Water even contain metabolism boosting ingredients that naturally help accelerate weight loss. Which fruit infused water is best for weight loss? The answer is: the one you will drink the most. When it comes to weight loss, more water is better and the goal is to drink as much as you can. Drinking infused water for weight loss is one of the easiest habits you can have to help you lose weight without a lot of effort. Drink a large glass of water before every meal, NO EXCUSES. This is one of the easiest rules to follow when it comes to weight loss and it’s also the most important. You must stay hydrated. Drink your first glass of water within 15 minutes of waking. Put a large full glass of water on your bed stand every night and drink it when you wake up in the morning. Have a pitcher of fruit infused water in your refrigerator at all times. Keeping a large pitcher of fruit infused water available will encourage you to want to drink more water. Plus, the vitamins and nutrients that the fruit adds to the water will provide an additional healthy boost. Buy a travel infused water bottle. A lot of people have reported their amount of daily water intake went way up when they got a travel water infuser. It’s convenient to take it to work, school, the gym, or on the road – it’s an easy and convenient way to drink more infused water. Hungry and want a snack? Go drink two 8 oz glasses of water and wait 15 minutes. If you are still hungry than your body needs food and you should have a healthy snack, if not good for you! You just saved yourself some calories, use that surplus to enjoy a nice glass of wine with dinner or to shave 200 calories or more off your daily total. Decaffeinated tea counts!! Going to Starbucks with your friends? Order a decaf tea!! You can count it as water and your beverage will be zero calories. Most independent coffee houses have their own specialty teas. Once I had a coconut tea that it was so delicious and much better than my husband’s 500+ calorie coffee drink! Try more recipes! We have our own fruit infused water book: Fruit Infusions has lots of recipes for cold and hot infused water drinks. 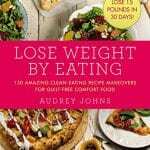 This book adds lots of variety to your fruit water recipe collection. Once you start drinking a gallon a day you will notice you are more thirsty and will crave more stomach slimming infused water. Your body will help you along if you can stick to it for a week or two. Our bodies need water to stay cool and hydrated, you will also notice clearer skin, stronger hair and nails and best of all water fills you up and it is zero calories! Studies have shown that drinking water is a proven method for increasing weight loss. Part of the reason is because water naturally raises your metabolism. Other reasons include: fills you up, flushes your system, and naturally helps your body release fat cells. What better way to increase your water consumption than to drink infused water for weight loss? 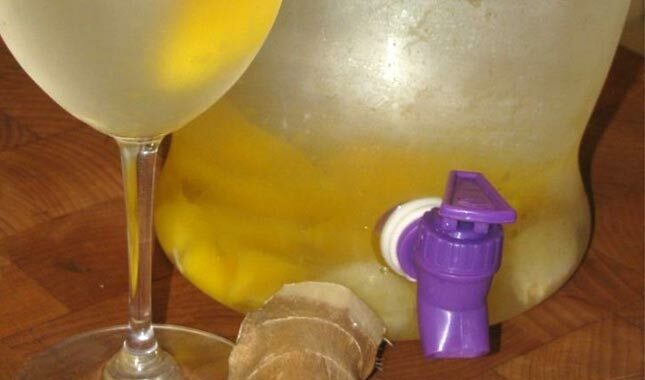 Make a pitcher to drink all day and watch your weight loss go up! I also like to have a fruit infused water bottle with me when I’m on the go for infused water water anytime, anywhere, at any hour. You can make a serving of infused water in a single glass, or use an fruit infusion pitcher to make a large batch. I like to keep a large pitcher of infused water in my refrigerator at all times. My family loves the taste and I’ve found I can get them to drink a LOT more water when I have a pitcher already made up and available. You can refill your infused water pitcher several times without losing a lot of flavor, and the pitchers also look really nice on a kitchen table. For detox water any time, check out our Recommended Fruit Infused Water Bottles or see our list of the Top 5 Best Seller Fruit Infused Water Bottles. The best thing about drinking this stuff is that you can try any combination of fruits and herbs to create your own recipes. Try adding fruits you really like or some you’ve never tried before. When it comes to making weight loss water, the sky’s the limit. The most important thing to remember is that any recipe works, as long as it helps you drink more water. Please reply in the comments below and let me know what your favorite recipe is. Enjoy!